The Labor Day gathering pushes for the city to become the first in Maine to require employers to provide paid sick leave. 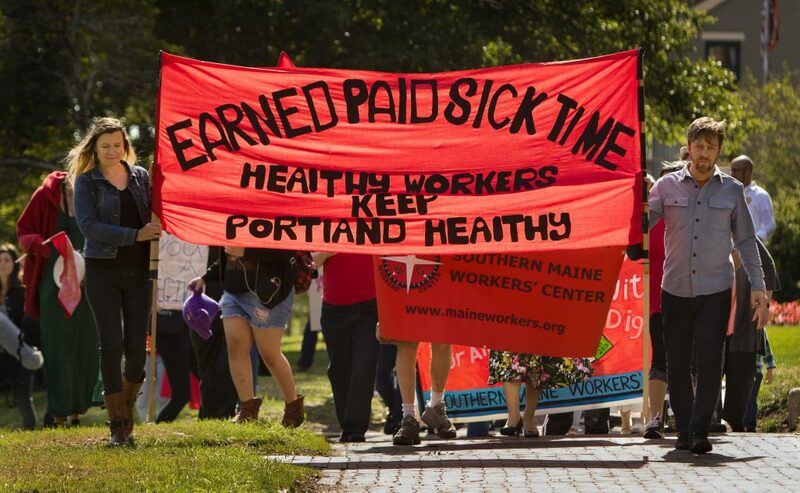 Activists rallied in Portland’s Longfellow Square on Labor Day in support of a proposed city ordinance that would require all Portland employers to provide paid sick leave. 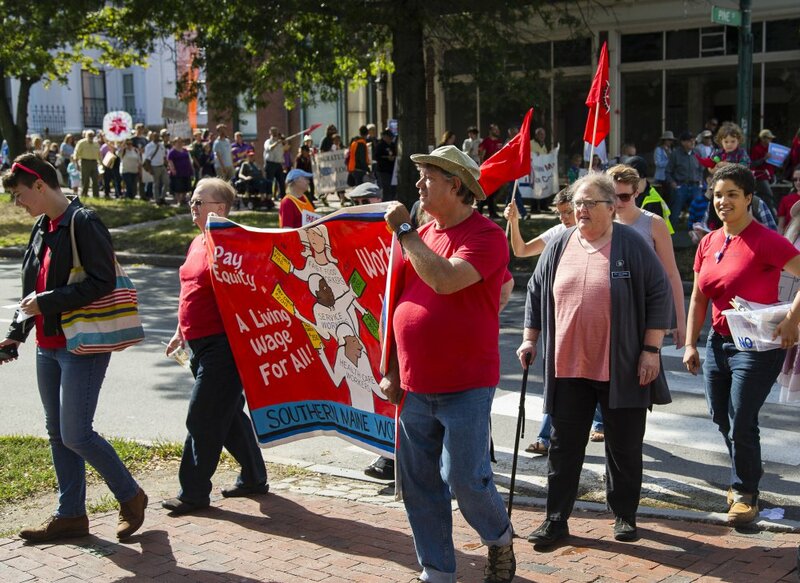 The Southern Maine Workers’ Center and the Maine Women’s Lobby held a short march and rally to officially kick off the campaign to support the ordinance, which would apply to all Portland businesses and will be presented to the City Council this month. The rally drew more than 200 people Monday, including workers who described having to choose between going to work sick and not paying their bills. If the ordinance is adopted, Portland would become the first community in Maine to establish a paid sick leave requirement. The Legislature recently shot down a similar proposal amid opposition from business groups. “Parents should not have to make that impossible decision of choosing between a paycheck and keeping their sick children home,” said Ina Demers, a member of the Maine Education Association, who talked about a fourth-grade student in her classroom who did not want to go home sick because the child worried her mom wouldn’t be able to afford their rent. According to Eliza Townsend, executive director of the Maine Women’s Lobby, 198,000 Maine workers are not able to take a paid sick day. With Portland accounting for 12 percent of the state’s workforce, the proposed paid sick leave policy could affect as many as 20,000 workers in the city, she said. The Southern Maine Workers’ Center said the lack of paid sick leave affects workers in the hospitality and health care support service industries, making it a public health issue, given the amount of contact these groups have with the public. The group also said it is a race and gender-equity issue because people of color, immigrants and women are more likely to have jobs where paid sick leave is not offered. John Ochira, vice chairman of the South Sudanese Community Association of Maine, said he knows many people who have had to make the “impossible choice” of going to work or giving up their paycheck to care for themselves or a sick family member. Last year, he was able to step in and pick up his nephew when he fell ill at school and his parents couldn’t get him, but not everyone has that option, he said. “The harsh reality for many immigrant and American families living in the city of Portland is they are stuck at work even when they’re sick,” Ochira said. Mayor Ethan Strimling backs the idea and plans to introduce the proposal to the City Council on Sept. 18. The proposed ordinance would allow employees to accrue at least one hour of paid sick time for every 30 hours worked. Workers would be able to earn up to six paid sick days a year. Unused days would roll over into the next year, but employers would not have to pay workers for unused time when they leave their jobs. The city would be charged with enforcing the ordinance, and the city manager’s office would have to investigate and rule on any complaints within 15 business days. Employers who violate the ordinance would be liable to pay up to three times the amount of back wages owed to an employee, and the city could issue a $100-a-day fine. Employees also would be allowed to bring civil action against their employer for any ordinance violations. A proposal to require employers statewide to allow employees to earn paid sick time was voted down in the Legislature last session. It was opposed by the Maine Chamber of Commerce, the Retail Association of Maine, the Maine Restaurant Association and the Maine Innkeepers Association. That bill would have required employers with 50 or more employees to provide up to 40 hours of paid sick time per year, while companies with fewer than 50 workers would have been required to provide unpaid sick time.